When Winslow Doyle is asked to find a lost hunter and his daughter in the wilds of Montana, he has no idea he is following a criminal trail that leads to murder. 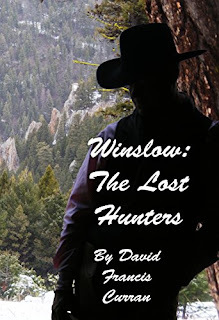 Winslow is a widower, but he was a wilderness guide at one point in his life and is used to finding lost pets and people. I very much enjoyed this story. It's one of those tales that make the reader keep going to find out what happens next. Winslow is an intriguing guy, still grieving the loss of his wife Lomahongva and just starting to move on with his life. The secondary characters are also well-drawn; the bad guys are horrific, and young Cassie, the missing daughter, is smart and resourceful despite her plight. In some ways, this book reminds me of Paul Doiron's Mike Bowditch series (except Mike is a Maine guide). I enjoy those books, partly because I live in Maine, but fans would also like this series. There's a lot of wilderness lore and backwoods knowledge needed to solve the mystery, and Winslow certainly qualifies with his background. Hopefully, Mr. Curran continues with the series. I can see people getting hooked on Winslow Doyle and wanting to read more about his crime-solving abilities. The Montana backdrop is also engaging; I always like books set in Big Sky country. A great start to the series.